We bought a camper to create special memories with our grandchildren, and Palisades State Park, just outside Garretson, South Dakota, proved to be a great place to start. 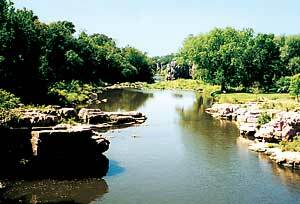 The Split Rock River runs alongside the campground in this beautiful park, which is filled with lovely red Sioux quartzite formations and chasms. We had a great time biking on winding roads, roasting marshmallows and taking part in the campground's organized weekend games. We also explored some of the area's colorful history. Legend has it that Jesse James holed up in a nearby cave in 1876 after a Minnesota bank robbery went awry — and then, with a posse nipping at his heels, escaped in a daring horseback leap 20 feet across Devil's Gulch in Garretson. Today, a small footbridge between the sheer rock walls marks that historic leap in Devil's Gulch Park, where we hiked short but scenic trails. You can see the cave itself — and learn about area wildlife and heritage — aboard the Jesse James Pontoon Rides, an informative and entertaining 45-minute tour. I recommend making reservations in person at Christmas in the Attic (505 Third St.; 1-605-594-2225), a quaint shop featuring lush holiday decorations and great gifts. Try the homemade ice cream at their old-fashioned soda fountain — it's delicious! As I watched our grandchildren busily collect acorns in the park, I felt a warm glow; I knew we were planting seeds for a whole new generation of wonderful travel memories.